This was a Haribo candy I had never seen before, then again I don’t usually seek out specific brands. I love fruity jelly/gummi candies so I wasn’t concerned about disliking this. The bag is a bold yellow and has fruit on it which is very similar to the overall design on the Haribo Raspberries bag. I love the fruit print! The colors are a bit muted and have a retro feel to them. (I love that!) 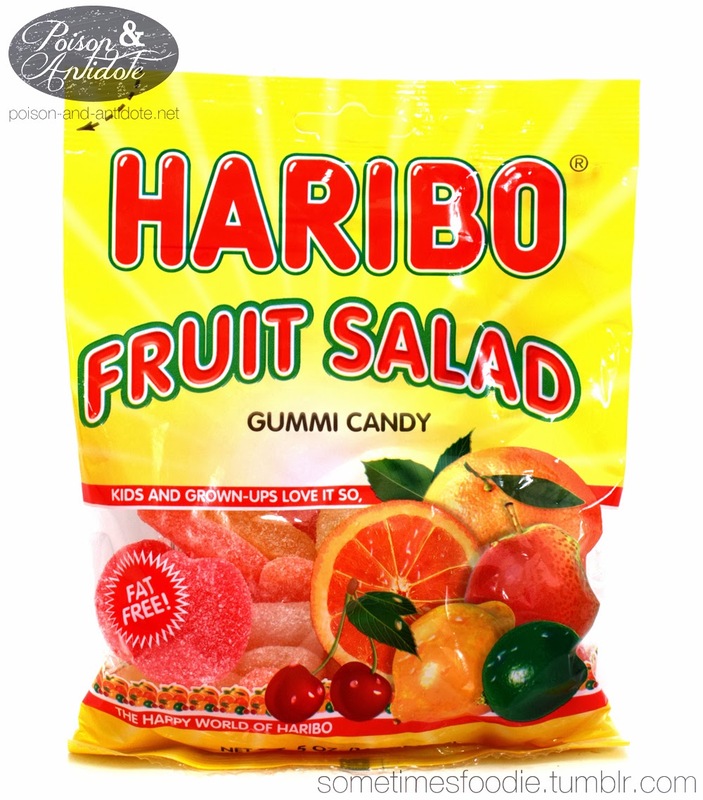 Unlike the gummi Dinosaurs and Raspberries, the Fruit Salad mix claims to be fat free. This doesn’t mean much to me, since I am not on a diet, or actively seeking out fat free candies, but this could be a selling point to other people. The candies smell just like Sourpatch kids. A light fruity scent with a hint of sour citrus-sugar. 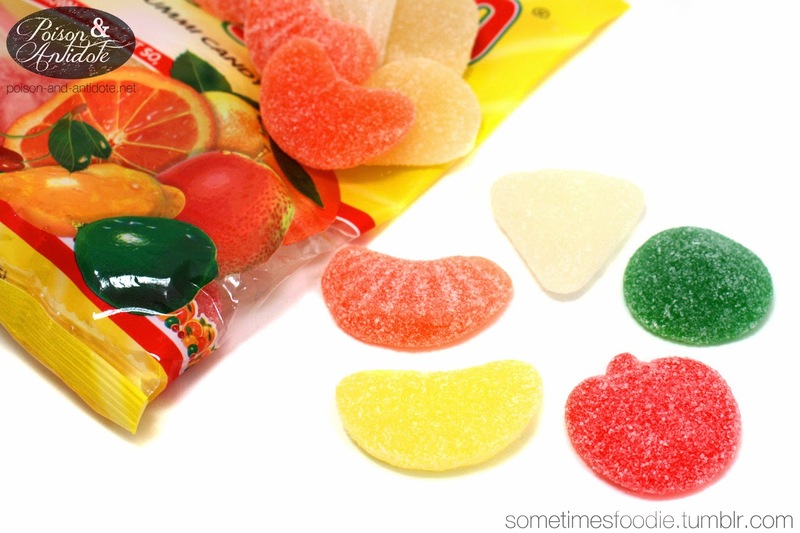 Each flavor of candy is a unique shape, I believe the flavors are cherry, lemon, orange, apple and grapefruit. Limes are shown on the bag, but I didn’t taste anything that reminded me of lime in the mix. There are a few different shapes in this mix, a citrus slice, a stout stemmed cherry, a circle, and a triangle wedge. Each shape is coated in a mildly tangy citrus sugar which adds some interesting texture to the mouth-feel. As far as candies go, these are great! They have bright fruity flavors that I really enjoyed. The sugar dusting isn’t as sour as other candies, but it adds a tartness to the overly sweet centers. The bite is more like a Turkish delight or pastel than a gummi, so these don’t have a bouncy-chew like the Dinosaurs, instead they are more like gelled like the insides of the Haribo Raspberries. If you like fruit pastels, these are very inexpensive and yummy.